› Author Affiliations Funding This study was supported and financed by an unrestricted grant from Bayer Health Care, Belgium. Background von Willebrand disease (VWD) is an inherited bleeding disorder caused by a quantitative (type 1 and 3) or qualitative (type 2) defect of von Willebrand factor (VWF). The heterogeneity of laboratory phenotyping makes diagnosing difficult. 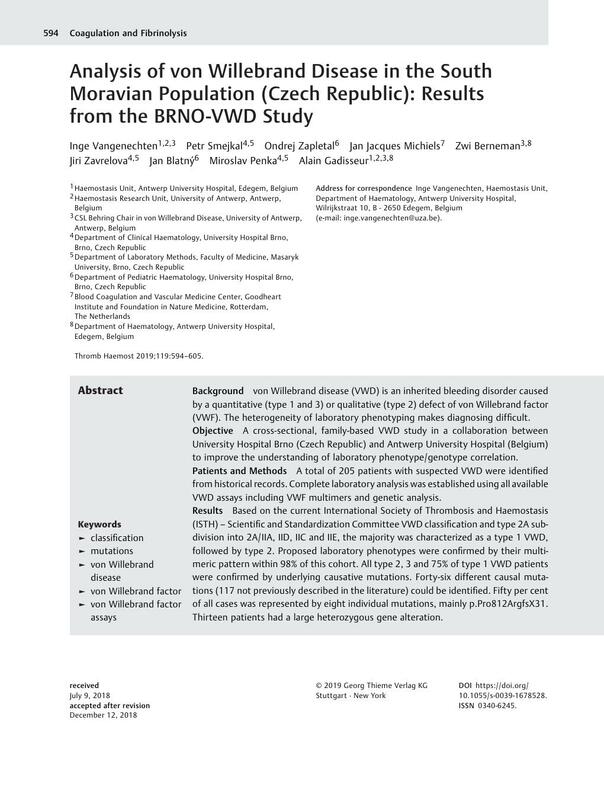 Objective A cross-sectional, family-based VWD study in a collaboration between University Hospital Brno (Czech Republic) and Antwerp University Hospital (Belgium) to improve the understanding of laboratory phenotype/genotype correlation. Patients and Methods A total of 205 patients with suspected VWD were identified from historical records. Complete laboratory analysis was established using all available VWD assays including VWF multimers and genetic analysis. Results Based on the current International Society of Thrombosis and Haemostasis (ISTH) – Scientific and Standardization Committee VWD classification and type 2A sub-division into 2A/IIA, IID, IIC and IIE, the majority was characterized as a type 1 VWD, followed by type 2. Proposed laboratory phenotypes were confirmed by their multimeric pattern within 98% of this cohort. All type 2, 3 and 75% of type 1 VWD patients were confirmed by underlying causative mutations. Forty-six different causal mutations (117 not previously described in the literature) could be identified. Fifty per cent of all cases was represented by eight individual mutations, mainly p.Pro812ArgfsX31. Thirteen patients had a large heterozygous gene alteration. Conclusion Although an extensive panel of tests was used, VWD classification and (sub)typing remains difficult and fluid. This study provides a cross-sectional overview of the VWD population in the Czech Republic and provides important data to the ISTH/European Association for Haemophilia and Allied Disorders VWD mutation database in linking causal mutations with unique VWD (sub)types. It also identifies new, as not previously described in the literature, causal mutations. A.G., J.J.M. and P.S. were responsible for the study initiation. O.Z. and P.S. were responsible for the sample collection. I.V. was involved in study design, data collection and performing laboratory analysis. I.V. and A.G. were responsible for analysis and interpretation of results and performed statistical analysis. I.V. was the lead author of the initial manuscript. A.G., J.B., J.J.M. J.Z., M.P., O.Z. and P.S. were responsible for revisions of the draft manuscripts. A.G. was responsible for review and approval of the final manuscript for submission.